I’m very excited to introduce my next pattern, The Edelweiss Dress! 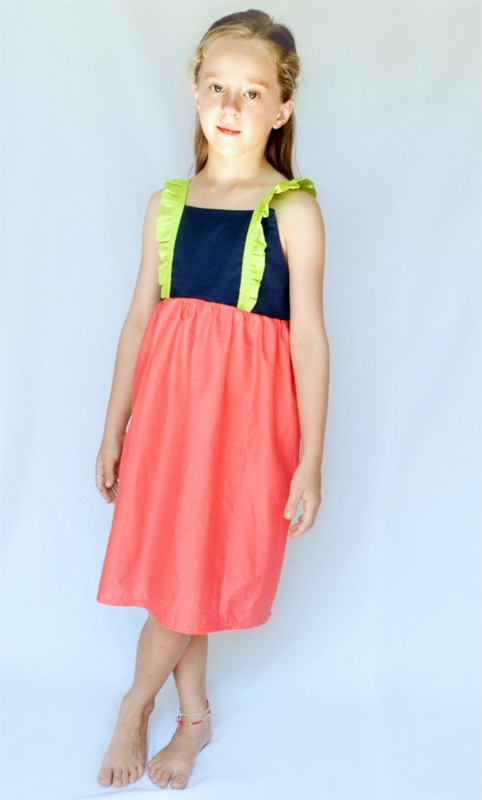 This is a cute little sundress, featuring an empire waisted bodice, ruffled straps, an easy buttoned back, and a gathered skirt in sizes 18 months – 10 years! I think it’s perfect for casual spring days at the playground or you can use fancy fabrics to dress it up for a summer wedding too! Have fun mixing prints between the skirt, bodice, and ruffles, or go for a color-blocked look. My favorite part of this dress is the small area in the front center bodice that is perfect for featuring a favorite fabric, a piece of embroidery, a vintage hanky, or really anything that is special to you and deserves to be front and center. The bodice pattern also includes a pieced option in case you only have a small scrap of special fabric. In this version, I used the mini-tutorial included with the pattern to create a chevron effect with stripes. There is also a tunic-length option for the girl who prefers to wear it with leggings, a cute pair of shorts, or her favorite skinnies. 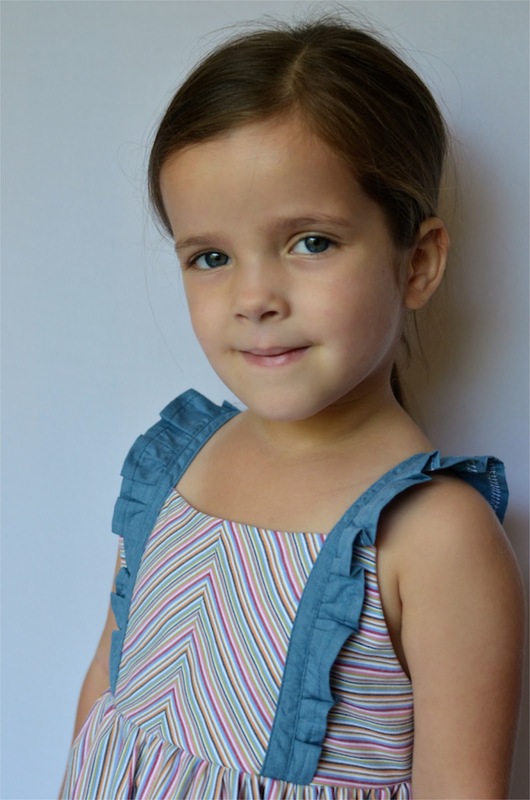 – a full sized pattern in sizes 18 months – 10 years – just print and cut the size you need, no tracing necessary! You can get the Edelweiss Dress pattern today over at the Hey June shop! BUT, if you’re feeling lucky, you can enter below for a chance to win the Edelweiss Dress pattern along with the Narita Dress and the Greenpoint Cardigan patterns! Just leave a comment below telling us how you know spring has sprung in your area. We’ll draw a winner on May 10. Open to anyone in the world with an email address, void where prohibited, one comment per person. Please make sure you leave your email address in your comment if it isn’t linked to your profile! « Fabric Fabric FAAAAABRIC Giveaway! Love the new dress, it is adorable! Spring has sprung all the flowers have already bloomed and the school schedule tells me the end of school is near, however my 50 degree weather is telling me otherwise! Such a cute dress! The spring “sprung” here by dropping 3 inches of snow last weekend :/ I think that things may be looking up now though! Thanks for the giveaway! well autumn is here now so i can only look at these wonderful patterns and dream of summer again. Spring has long been sprung–the pollen has fallen and is now a distant albeit unpleasant memory. Now we anxiously await the opening of the magnolias and gardenias. It has been warm and sunny here! People have even started mowing their lawns. All the tulips popped up and the grass got green…then it snowed last week! Ha! But it feels back to Spring today with some warmer temps and buds on the trees. Sweet! Spring here means our fig tree is in full foliage again and the peacocks around the way can be heard for miles calling their mates. Adorable!! Spring has certainly sprung in Seattle – we had a gorgeous weekend and spent it all outside! You can tell it’s spring in Michigan because everyone has replaced their winter wardrobes with summer ones, and they refuse to dig out a jacket or scarf even if the temps dip back down again! These are adorable!! Love it with the skinnies! Spring has sprung here because our pup spends his days laying in the front yard instead of on my bed! Spring has arrived in NC but you wouldn’t know it from all the rain! So cute!! I especially love that you have included a placket! So many patterns that I want don’t but I need one that tells me how to do it!! Spring has sprung here because I woke up to a clean car since it rained all night! Hi… Spring in Holland is as turbulant as can be… But today we enjoyed the sun, a barbecue in the garden and lots of fun with my three year old daugther in a little swimming pool! We count our blessings! It’s eighty degrees and sunny here! I think my toddler got muddier and filthier this weekend than he ever has in his life! OHHHHH congrats on another great pattern! I know spring is here because I can’t see our neighbors across the street anymore because the leaves are back on the trees. I know Spring has Spring when everyone is sneezing! The pollen is horribly thick in Atlanta! But the fresh fruits and veggies make it all worth while! Tulips!! Flowering trees! Leaves budding!! FINALLY. It seemed it would never get here but spring has sprung! Thanks for the chance to win. I think the color blocked version is my favorite. Very cute. So cute!! I especially love the colorful stripey chevron-y one! The lilacs are blooming and the poplars are fragrant. Thanks for the chance! All of the trees are finally budding! I can tell it’s spring because my kids never want to come inside! The tv is no longer on 24/7! Yay! Today is the first warm day in my neck of the woods – in my book – but I know it’s spring bc my kids have been running around the yard naked for weeks! I’m clearly behind in making some spring clothes! I sure could use these patterns! Thanks! Living in northern Canada, we still have some snow on the ground that is slowly, slowly melting…hoping it will be gone by the weekend! we know it is spring when the bugs come out and yard sales start popping up everywhere! Spring has arrived in West Virginia…blooms,allergies and some rain today. Spring is here when the daffodils and grape hyacinths come out. Thanks for hosting! oh my that is so sweet! Spring is here when California cant decide if it wants to be sunscreen weather or umbrella weather! We just got rid of the last of our snow 2 weeks ago. The grass has finally greened up this week! My kids are spending LARGE amounts of time outside now! Finally getting some leaves on the trees around here! Thanks for the chance to win such cute patterns!! The bushes in my front yard EXPLODED with flowers last week! So beautiful! Great patterns! We can’t tell spring has sprung yet- it’s May and I’m still wearing a sweater in South Louisiana. That’s unheard of! Today was the first dress-day in the Netherlands. I hope it sets a trend and many more will follow! I know it is spring when the farmers start spreading manure on the fields. We live in between two farms so we get to enjoy that rather odious spring ritual. All the flowers are in bloom! It’s gorgeous outside! The wildflowers in our yard are looking amazing – it must be spring! What a fabulous giveaway, we are in Fall over here but the weather is still quite warm but the rain is coming more often and it’s greening up outside. We are still waiting, it is Missouri!! so so cute. I love these patterns. 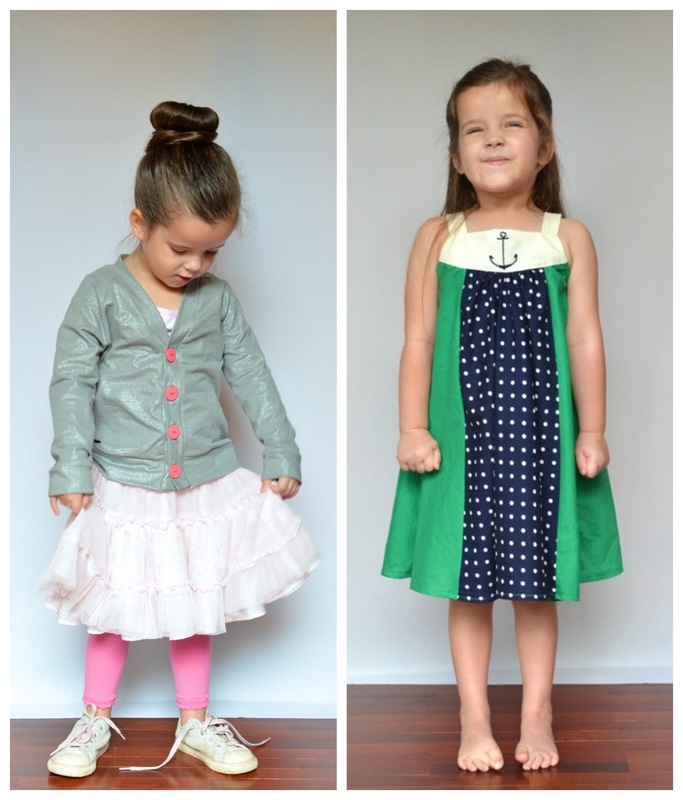 I like that they go so far up in size – it makes it so easy to sew them for both of my girls. and we have had a great spring so far in Florida. I am so sorry to say that because I feel so bad for those that aren’t having great weather. Spring is the best season. Your patterns are so cute!! I know it’s spring because it’s already over 80 and the wildlife here is going crazy building nests! This year spring has brought the worst allergies I’ve ever had. Glad for the rain today to clear the pollen out of the air. Pollen is in the air and the wind has definitely picked up! Definitely spring. Cute dress! Everything is vibrantly green, so it’s definitely spring. I love this dress! So versatile! I am in Tennessee too and I can tell because the helicopters are flying. When they are done I can open the pool!! Thanks for a chance to win a great giveaway! Love the patterns. I love the spring weather and blooming trees! For a while it looked like winter was never going to end then suddenly all the snow was gone. Even now the sun is shining. My irises under the mailbox are blooming! It feels like we skipped spring here in North Idaho. We had snow and then it was warm enough for shorts, all in the same week. all the cherry blossom tress are blooming! Our trees and bushes are finally waking up! I can tell it’s spring where I live when I can smell skunks daily!! And I love the fact that this pattern goes to 10 yrs because I can make ALL my daughters match!! How I know that spring is here? I’m sweating whenever I go outside! Its hot already! spring springs here when the flowering trees come out! they’re almost done here, so i’m going to go ahead and say that it’s most definitely spring! My son’s allergies have kicked it into high gear! Poor boy. Spring is here when the almond trees looks their flowers. Thanks for the giveaway, your patterns are lovely. We keep bees. So spring means installing packages of bees and feeding sugar water until they are good and established for the season. In addition to the flowers, spring around here means bugs! my flower bed is going crazy happy! I have been cutting grass today nuff said! I know spring has sprung because my allergies are driving me crazy! All the pretty pink azaleas in my yard are disappearing now, so it’s been spring for a while. Thanks for the chance! we have lots of trees blossoming in our road, and our seedlings are coming up! when the flowflowers starts blooming and the sun shine bright! Love the patterns, all of them! They will make great summer clothes! I live in Colorado so it is not the right weather for those things yet. I know spring has sprung because the snow has been heavy, wet and melts quickly in the last three storms. Yeah. Colorado snows every May. At least once. Oh, so cute dresses! I got to win this :)! love them. The warm weather has arrived and the winter coats are put away! We only get a few (maybe) weeks of spring in my area. We’ve already been having 90+ degree weather the past few weeks. I’m quite happy though because I love warm weather. Spring has definitely arrived when we see the hummingbirds and the deer with their new fawns. Thanks for the giveaway chance! I’m in Illinois and everything is blooming. The grass needs cut and everything is covered in a yellow layer of pollen. And my favorite way, the sun is shining in the window. Very cute dress. Spring has sprung here in pa. because all our flowering bushes and trees have those beautiful flowers. ANd the trees mostly all have their leaves but they are the light green shades, not dark yet. In NC it feels like it is April Showers not May flowers but flowers and trees look gorgeous from all the rain! April showers. Ha ha. So much rain!!! Eeekkk what a gorgeous pattern! I always no when spring is coming because the wattle trees come out and I start sneezing! Spring has definitely sprung, our veggie patch is looking greener by the day! I’m so excited, it’s our first year in the new house it’s nice to see we’ve chosen a good patch to grow our favourite vegetables! I’ve dug my flip flops out from the back of the wardrobe! Thanks! Spring has sprung here as we are not having any more cool weather. We never really get a winter, maybe a couple of freezing days but Thant is about it. The butterflies and humming birds are back in the garden along with many species of birds as they start heading back north. The wild parrots are back. And the best part are the baby birds are starting to stretch their wings and fly out of their nests. The straggler getting a little nudge from momma as if to say come on get a move on now we don’t have all day to wait on you, we have places to go and things to see LOL. It’s so cute. I know it is spring when I don’t feel like I am freezing to death anymore. And i can stop living in sweats & fleece 24 hours a day. Thank you for the chance to enter yoru giveaway. The weather is nice where you don’t have to wear a jacket. Unfortunately my cat brought me a chipmunk. Spring is here. Cute ! Thanks for the chance! When I can see the carpet of blue bells in the forest. Thanks for the give away!! Spring has sprung when my daughter’s birthday and my niece and nephews birthdays and my wedding anniversary all start rolling around. Unfortunately in Sacramento, the first sign of spring is allergies! Most people who live here develop them and just about everyone I know is miserable for the first 2-3 weeks of spring. Daffodils. Although They usually peak out as the snow is having it’s last hooray and I am always worried that they will die because of it. They never do and spring comes quickly after that. all the pretty colors. Spring in the Pac NW are just lovely…the sky is blue the grass is green the flowers are out…lovely! Thanks! i vow to make that dress fit me, darn it! love baby animals in the springtime! sorry, let me rephrase: “Alberta is very strange” – as to weather! Spring has sprung cold here. I know the people up north would laugh at me for saying that but we have had highs in the lower 60s. That is around 20 degrees lower than it is here normally. I grew up in the south and don’t ever remember it being so chilly in May. I know spring is here because of my allergies. ahhhhchoo. I know spring is here by the muddy little footprints all over the house! I know Spring has sprung here because one day it’s 80 degrees and the next day it’s snowing….lol Gotta love springtime in Michigan!! When the blossom, daffies and tulips finally put in an appearance… The hint of spring is when it gets too warm for my down jacket. Thanks for the chance, you’ve got some lovely patterns!